For many public radio reporters — even some of the most experienced ones — the prospect of a two-way can be daunting. You’ve been gathering facts and collecting tape, and now, you have to sit down in front of a hot mic and communicate what you’ve learned in conversation with a host. If you’re accustomed to scripted stories with tracks and acts and ambience, being interviewed by a host may feel like a partial loss of control over your material. The risk of making a mistake feels heightened. And of course, thousands (or millions!) of people are listening. At the same time, two-ways allow hosts and reporters the opportunity to sound looser, more curious, more human, and often, more authoritative — all qualities listeners expect from NPR. But that’s not always how two-ways end up sounding. 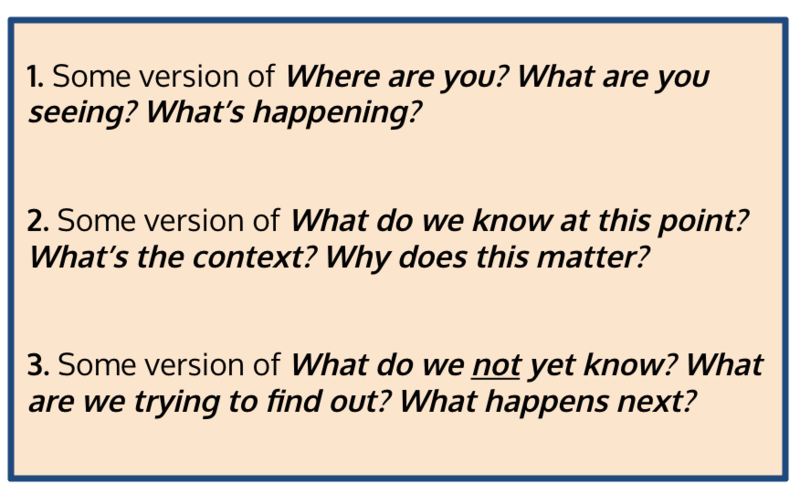 The following guidance was developed to help us have more “normal” conversations on newsmagazines, while maintaining the integrity of our journalism. This should not be interpreted as a template; no one wants cookie-cutter approaches! It is a set of principles and recommendations aimed at avoiding that “scripted” sound that many listeners dislike and at least one NPR executive has called “radio death.” Most importantly, it’s aimed at giving our audience the best listening experience possible. Are live two-ways different from taped two-ways? NPR Senior Editor Bruce Auster says two-ways are like jazz: They involve “improvisation within a structure.” The fundamental challenge with each, regardless of its type, is to find the appropriate balance between conversation and information. Let’s start by illustrating a few different scenarios in which NPR commonly provides coverage via two-ways. Joe sounds human. You can hear in his voice how struck he is by the scene of devastation. He stumbles a bit — and that’s OK. He sounds authentic and in the moment. He plays the key role of a reporter in a scene like this — eyewitness — by describing what he’s seen. He says, “I don’t know,” to one of Robert Siegel’s questions, but then offers up additional context. It is OK to not know the answer to a question, especially in a breaking news situation! Example #2 — DAILY NEWS EVENT: Due to logistical challenges — and the frequent lack of audio — we often do two-ways about court proceedings, instead of pieces. Megan Verlee of Colorado Public Radio had to communicate complicated details about a court appearance by James Holmes, the man who committed a mass shooting at a movie theater in Aurora, Colo.
Megan breaks down a complex series of charges into understandable categories — by focusing on the most critical information and staying out of the weeds. Her first answer is less than 30 seconds long, which helps to maintain the conversational quality of the two-way. In the second answer, she offers her impression of James Holmes’ appearance — “To me, he seemed much more alert.” This is not pure opinion; it’s journalism. Megan has been covering the story for a while, so her impressions over time become a legitimate part of her reporting. Example #3 — CULTURAL CONVERSATION: Linda Holmes is NPR’s pop culture blogger and host of the podcast Pop Culture Happy Hour. She often talks with hosts on the NPR newsmagazines, and these conversations are an example of the more freewheeling style a two-way can take. Linda and Audie sound like they’re talking, not reading. Completely conversational. They laugh. They are actually having fun (as opposed to faking it). Linda responds in personal terms. She’s a critic; this is all about her (informed) sensibilities. Linda and Audie likely talked to each other before the conversation; they thought through this together. Finding a focus: We often try to achieve too much with two-ways. We pack the air with more facts than a listener’s brain can take in. So the first step is deciding, realistically, what your two-way can achieve. As with any story, can you identify the specific goal of the segment? Is there a central question you will attempt to answer? Can you lay out several key points you need to get across to your listeners — and why they are important? Can you establish a logical arc, so the questions make sense in the order they appear? Ideally, this conversation happens with an editor. It can also involve the host, since s/he will carry half the conversation but, of course, hosts are busy. In the absence of an editor or host, you can also talk with a peer. Whoever you talk to, they should try to play the role of the listener or host — someone who knows less than the reporter does about the topic. This person should ask questions as they occur, based on his/her curiosity and desire to understand the topic. 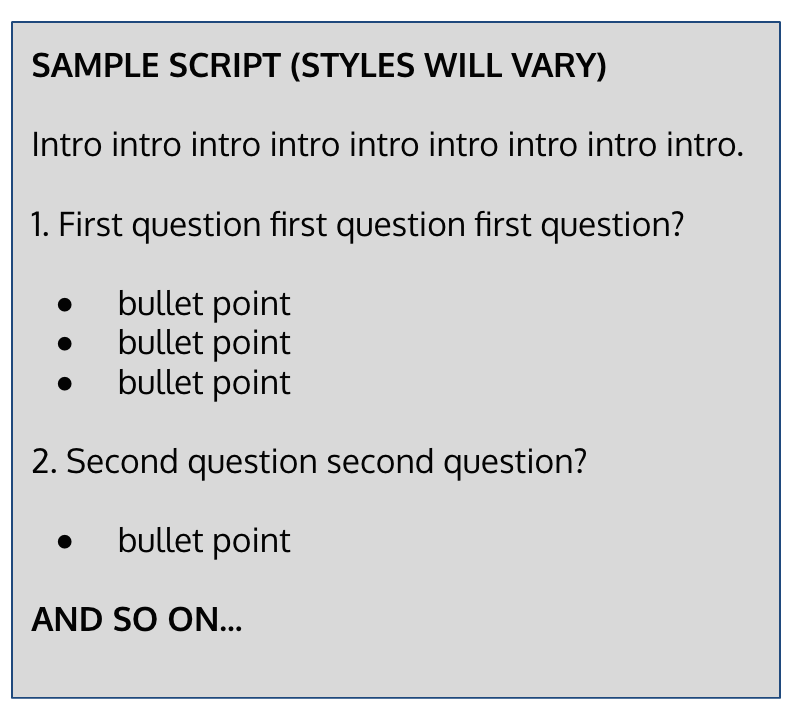 To script or not to script (or something in-between)? There is not one perfect answer to this question. But the end goal is clear: If the reporter and host sound like they’re reading, we have a problem. Some reporters seem to be able to magically read their way through a fully-scripted two-way and “perform” it naturally, but this is rare. For most of us, a word-for-word script becomes a crutch. The solution, however, does not require that reporters and hosts go entirely “off-script” (though we recommend trying it when possible!). Especially when the subject is complex and potentially controversial, we can sketch out two-ways with brief bullet points. The bullets might include key facts the reporter must get right — or critical ideas the reporter wants to emphasize. Have I identified the key points I need to make? Have I organized my thoughts in a logical way that listeners can follow? Do I have descriptive examples that will help explain my topic and/or plant pictures in listeners’ minds? Can I tell this story well in the time allotted? Here’s a two-way featuring NPR Correspondent Frank Langfitt and Morning Edition host David Greene. It could have been, well, “radio death.” The topic is heavy and complex. It involves China, security issues and unfamiliar islands in the Pacific. But it manages to sound conversational, while conveying information clearly. As you listen, read along in the script excerpt below. 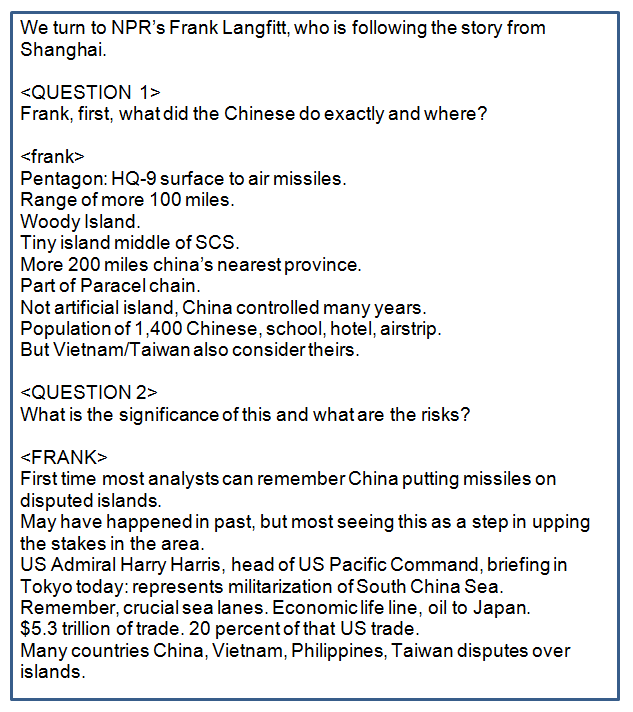 You’ll see that Frank wrote himself only key points, not entire answers. And neither he nor David read exactly what’s written. They put questions and answers in their own voices. Notice how Frank pivots in his first answer. David asks the question in a slightly different way than is written, and Frank — on-the-fly — rearranges the information in his answer. Frank is a former print journalist. He says that learning to do two-ways required him to leave behind the comfort zone of written words. It took effort and time. Now, since Frank works in a far-away time zone, he doesn’t usually have the opportunity to construct his two-ways via conversation with an editor. So he describes his process this way: “Write out what you’d like to say, but then cut most of it. Anything you could get wrong — numbers, dates — write them down.” Frank says he has also structured two-ways by talking into his recording device, transcribing what he said and then cleaning it up. Frank says the other keys for him are confidence (if you know your stuff, if you’ve reported it out, you can talk about it!) and a willingness to go with the flow. Lack of clarity about the focus of your story: Two-ways suffer if the reporter (and editor) has not figured out what the key points are, where the conversation starts, and where it should end. Rachel Martin suggests, “If you can’t sit down and write your intro, you probably don’t know where your two-way is going to go… [The intro] helps you focus your thoughts.” It also helps, both for focus and for the recording process, to know where you need to end. What is the final point you want to leave listeners with? Sounding over-scripted or “canned”: This is the quickest way to doom a two-way, in part because it confounds the expectations of the audience. Your listeners have been introduced to this segment as a conversation between host and reporter. They might even be picturing a reporter sitting in an imaginary radio studio with a host. So when they instead hear a more stilted, non-conversational tone, they can get confused. Trying to sound NPR-ish: Everyone has the sound of certain NPR voices in their head — and that can give us something to aspire to. But it can also hold us back. The goal in a two-way should be to sound like yourself — or as NPR reporter Sam Sanders says, “Just do you, people!” Of course, that’s easier said than done. Fear of failure: Especially when you’re going on-air live, fear of failure can make us clam up. We put too much pressure on ourselves to be perfect. The best thing to remember in these moments is (1) You are human, and your listeners understand if you stumble and have to correct yourself, and (2) You know your topic. Trust yourself! Getting into the weeds: Avoiding the weeds can be especially challenging for the most knowledgeable reporters. You know your topic extremely well. It can also be tough to translate a local or state issue to national air; your local audience may care about details that would confuse the national audience. The best ways to avoid the weeds are (1) To lay out ahead of time the key points you need to make for the audience at hand, and (2) Prepare for your two-way with an editor or a peer who is less immersed in the topic. This person can warn you when you’re straying into weedy territory. Squeezing too much into the first answer: When the first answer lasts too long, the two-way loses its identity as a conversation. You can avoid this by talking ahead of time with an editor, host or peer. S/he can listen for the natural moment to break up a long answer with a question. Losing track of time: If you are appearing on an NPR newsmagazine, you should have been told how long your segment is. If not, ask. Then, stick to that time! That goes for live two-ways and taped. For some people, running a stopwatch does the trick. Others get accustomed to a producer warning them in their ear — “30 seconds left!” — during the taping. First of all, it’s important to remember that the host is as equally important as the reporter. If all the host does is ask “What?” and “Why?” they might as well not be a part of the two-way. So hosts must play a more substantial role in the conversation. Hosts want to both channel the curiosity of listeners and make the reporter sound great, or as Rachel Martin says, “to bring out your best reporter self.” She adds, “Our job is to actually hear what you’re saying and then react like a normal human… would react.” And sometimes, that leads hosts to go off-script: They are listening closely and hear a natural question that’s not on the script, or they sense that a follow-up is needed. That is their job, even if it means going “rogue”: to help listeners understand information and to help the reporter convey it. To serve as a proxy for listeners: What do they want/need to know? What might they not understand? In the end, nothing beats direct communication. Two-ways are better when everyone involved — host, reporter, producers, editors — have the same goals and a shared plan. Are live two-ways different than recorded two-ways? They should not be. At least, not among audio professionals. Yes, it’s true that — when we tape two-ways — we can go back and redo answers. But as a general principle, aim for “live-to-tape.” This allows the reporter and host to step up and perform, because they won’t view the initial taping as a rough draft. Also, it’s practical; everyone has limited time, especially on daily newsmagazines. As professionals, one of our goals is to make each other’s jobs easier. So approach a taped two-way as if the curtain has opened and you’re on stage — now! Are there rules about whether you can use tape in two-ways? If it serves the story well and doesn’t interrupt the flow of conversation, the tape may be worth using. But adding too much tape can be problematic, especially on deadline, since it presents additional production challenges. So, as a general principle, use tape when it’s great — and when it makes your two-way even better than it would be otherwise. Something to think about: How will tape be introduced in your two-way? The alternative — a more scripted ‘in cue’ to tape such as “Professor So-and-so says the new law will create problems…” — doesn’t go far enough. That’s because it doesn’t explicitly tell the listener they’ll be hearing another voice. It can be confusing and distracting, as the listener recalibrates his/her expectations. In the two-way above, Geoff uses two cuts of tape in the course of the conversation. In the first, he is really explicit with the set-up, since it’s all about the sound. He says to the host, Kelly McEvers, “I can play you the actual sound of the discovery if you want to hear it.” Very conversational! MCEVERS: I mean, if [the gravitational wave] was so small, how could they be sure that what they were saying was real? BRUMFIEL: You know, I asked them that myself. And I was surprised to hear that many of the physicists involved were skeptical when they first saw the signal. Here’s Rainer Weiss who’s been working on this since the 1960s. KEN WEISS: I felt disbelief. A lot of us felt that way until we really did all the checks. And then little by little, all of us began to believe. Of course, there is a time and a place… but two-ways like this one can be fun for the audience and great practice for reporters and hosts. And there are less radical moments when you can go script-less. The more we mix up our approaches, the more engaging our coverage will be. Thanks to everyone at NPR and member stations who contributed thoughts for this post. And a special thanks to Bruce Auster, Andrea de Leon, and Rachel Martin.